We’d love your help. Let us know what’s wrong with this preview of Kindness Rules! by Eunice Moyle. 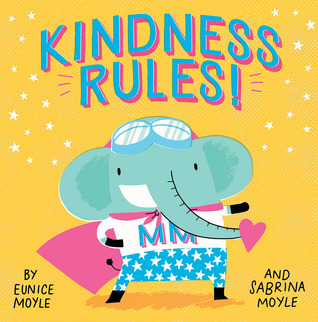 To ask other readers questions about Kindness Rules!, please sign up. Be the first to ask a question about Kindness Rules! 3.5 stars -- Vibrant, cute, and hip little book presents the values of manners and kindness in an active way kids can apply to their everyday situations. There are not only typical manners, such as sharing and "please & thank you," but also less remarked-upon, but still important, values like not playing too rough with others and respecting personal space. The vocabulary may be over the heads of the intended audience. There is definitely a place for this one in my school library.